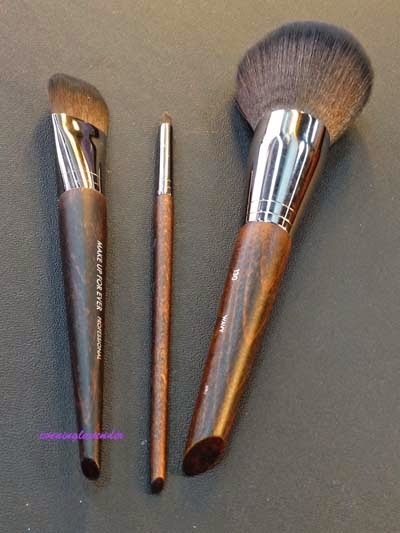 Evening Lavender: MUFE Artisan Brushes - Why brushes not fingers? It has been quite some time since I blog. 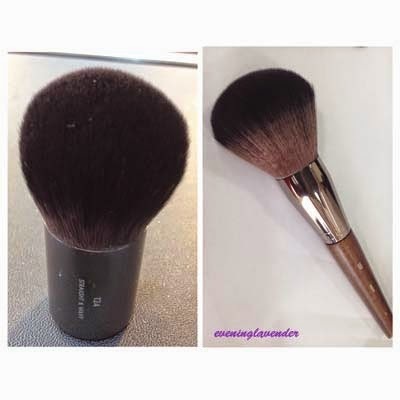 Today I am going to talk about MUFE artisan brushes. Do you prefer using brush or finger when you do your makeup? 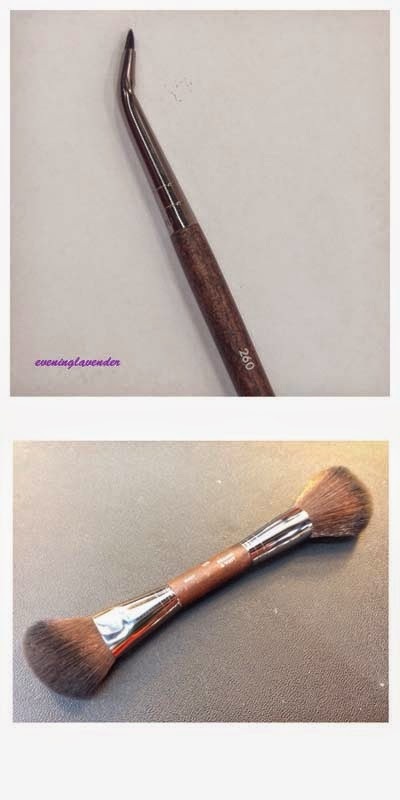 Make Up For Ever (MUFE) has launched 75 artisan brushes a few months ago. Although the brushes are made from 100% engineered non-natural fibers, they are as soft as the feel of natural hair. I am really impressed with the look and feel of these brushes. No wonder the creation of these brushes is considered as a brush revolution! The MUFE artisan brush collection has so many different types of designs - tapered, trapeze, square, fan, flared, round, pointy and angled to allow optimum control in applying, blending, sculpting, shading and lining of make-up. We were very lucky to have Ms Erika Saenz, Regional Educational Manager MUFE South East Asia to walk us through the features of the brushes. Before that, I have no idea that there are so many different textures of bristles. 5. A 2-in-1 accessory – each brush has a beveled tip bottom that is designed to mix 2 shades of liquid foundation to achieve the perfect tone. Ms Erika also did a makeup demo on a model. 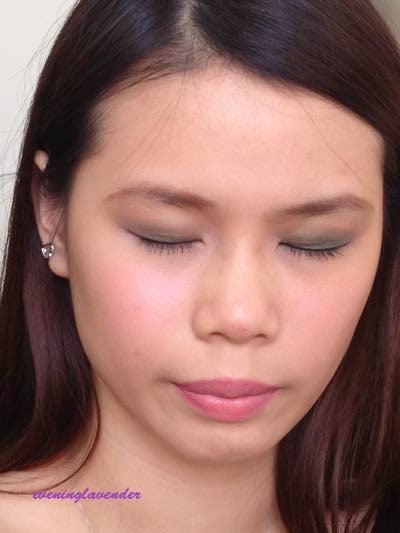 The makeup was applied using fingers on half of the face while the other half, Ms Erika used the MUFE brushes. It is very obvious that the side where brushes were used looked more even toned and defined. The makeup on the right was done using brushes. The color is more intense and well blended. #260 Bent Eyeliner Brush - it is an angled brush (30 degree angle) that is designed for applying eyeliner to its precision. It is able to draw a 1mm line with precision. #158 Double-Ended Sculpting Brush – Use the angled end to place your blusher for a slimmer and uplifted appearance followed with the fluffy end to blend away harsh lines. 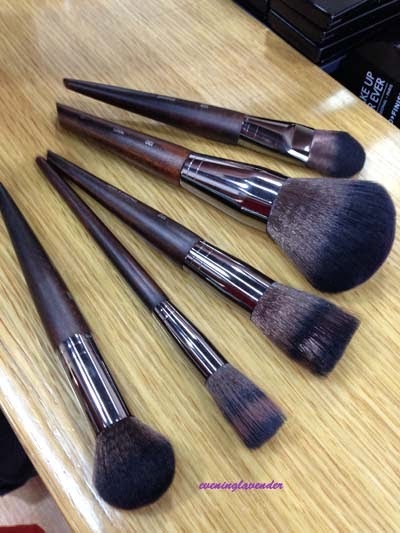 If you don’t own many brushes, you may consider investing in MUFE artisan brushes. Just get the basic few that I have listed above and you will enjoy doing your daily makeup with fabulous result. The price ranges from RM37 – RM235. Since Christmas is coming soon, you might as well get yourself some MUFE artisan brushes that can last you for a long long time. MUFE artisan brushes are available at MUFE Pro Boutique Sephora, Starhill Gallery (2nd Floor), Sephora Paradigm, Sephora Sunway Pyramid, Sephora Gurney Paragon, Sephora NU Sentral, Sephora Queensbay Mall and Penang Gurney Plaza. Till then, have a good week and thanks for dropping by.